Service stations are strange places, transient and uniform, over-expensive and by definition next to loud motorways. In general, they get a bad press, although in a strange way some are a welcome sight when finishing an especially tiring stint of motorway driving. The contradictory nature of these places (which are never incidentally ‘stations’) is perhaps why efforts are continually being made to prettify the buildings and surrounds, which nowadays includes the default exploitation of public art in various forms. (Art seems to be an obligatory element of most new public facilities nowadays, with new schools and hospitals coming to resemble vast art galleries that most visitors / consumers simply ignore.) And one of the most memorable examples of this trend in Scotland was a short-lived mural at Abington Service Station which depicted aspects of the long-term occupation of the surrounding landscape, all the way back to prehistory. Despite the mural now being a thing of the past, presumably painted over, I took a fieldtrip there a few days ago to remind myself what it was all about. Entrance to Abington services. Note: this image does not depict the Abington area! The mural was painted by David Fisher at the Abington Service Station, in South Lanarkshire, a facility serving junction 13 of the M74 motorway, which connects the M6 with Glasgow. It was one of 13 huge murals painted by Fisher in service stations between 1987 and 1993, commissioned by the Trusthouse Forte network. Some of his other service station murals include Gretna (M74), Woodhall (southbound M1), Pease Pottage (M23), Sedgemoor (M5) and Membury (M4). In each case the mural depicts scenes from the history of the general area, or associated events and activities. The murals tend to fill up big and sometimes unusually proportioned wall spaces at the service stations, wrapping around multiple walls. Fisher felt that this was a positive contribution to service stations which he described as ‘dreadful’. 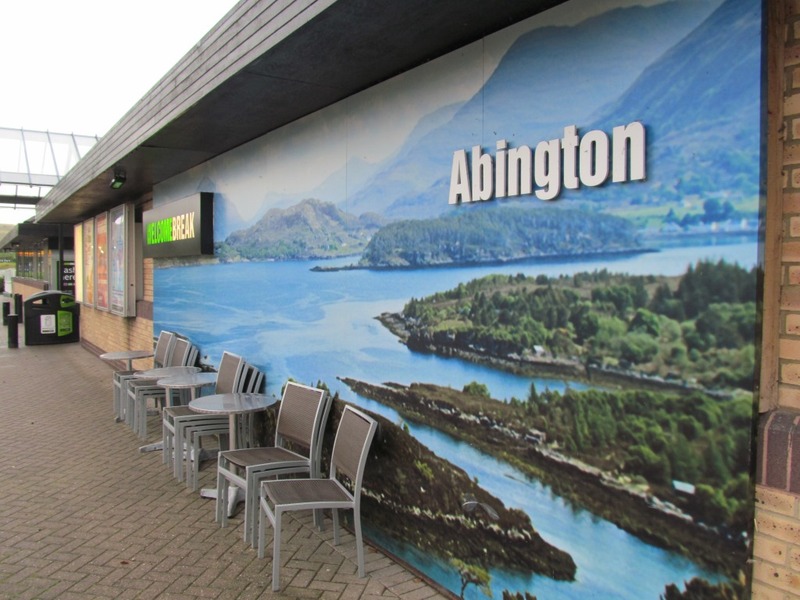 Although the M74 was initially constructed here in the 1960s and opened in 1964, the Abington service station is a much newer aspect of this road, having been opened (according to a shiny plaque near the entrance) on the 17th June 1993. This means that it is almost certain that Fisher’s painting was commissioned for the opening of this new facility. 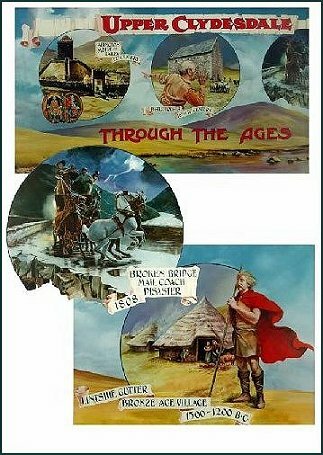 In the case of the Abington service station, the mural appears to have been inspired by the diverse series of historical stories and archaeological sites associated with the area, including Bronze Age settlement, Iron Age enclosures (see the photo above) and a Roman fort. Despite appearing to be in the middle of nowhere, Abington (and neighbouring village Crawford) sit at the junction of two major natural routeways, utilised for thousands of years and now filled with a motorway and other main roads, power lines and a railway track. And the mural is a reflection of a rich local identity – the people who once lived in this area, the stories attached to this place, the historical significance, the time-depth, the people. And it was extensive in scope spatially as well as temporally, covering several wall panels, wrapped around the entrance area. One panel of the mural depicted a stereotypical Bronze Age ‘celtic’ style character, all blond hair and muscles, standing in front of a timber roundhouse, the des res of later prehistory in Britain. Standing within the doorway is a huddled pair of women / children, presumably the family of the spear wielding chief. They appear to be sheltering from the sudden gust of wind that has made the man’s cloak billow enigmatically. Beneath this scene of MBA (middle Bronze Age) family life, written in a scroll, is the legend: ‘Lintshie Gutter Bronze Age village 1500-1200BC’. Lintshie Gutter?! What kind of name is that for a village? And did they even have villages in the sense of the word we understand 3500 years ago in rural Scotland? Er, probably not, but is more effectively conveys to the public what the drawing depicts than the reality, Lintshie Gutter unenclosed platform settlement (known to archaeologists by the snappy acronym UPS). 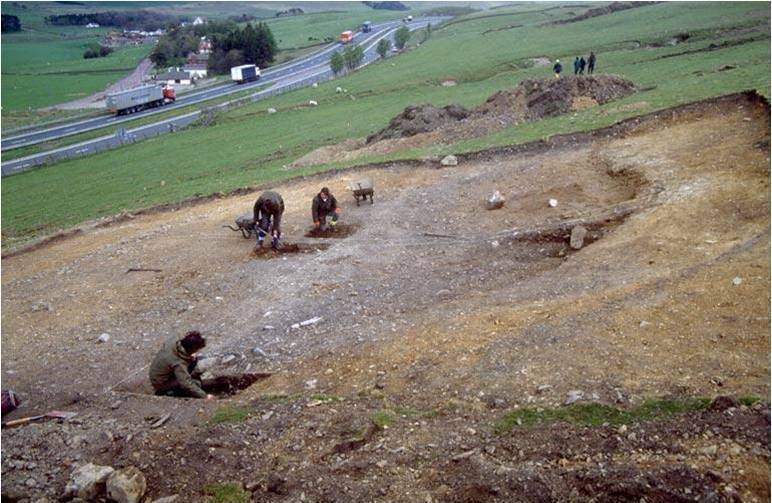 Lintshie Gutter is a Bronze Age settlement that was excavated during the upgrade of the A74 to the M74 (or A74(M) if you want to be pedantic) in the early 1990s by GUARD, a commercial archaeology unit with the assistance of the Biggar Museum Trust. 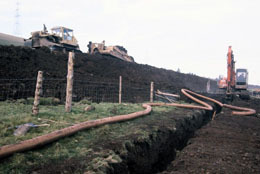 The excavations were funded by the Scottish Office Industry Department (Roads Directorate) under the auspices of Historic Scotland. The site is National Monuments Record of Scotland number NS92SW 28. It is located about 5km to the south of the service station. The site was historically known as Hurl Burn, and A. Graham recorded its existence in an overview of cultivation terraces in southwest Scotland, published in 1939 in the Proceedings of the Society of Antiquaries of Scotland. It was one of over 130 ‘cultivation terrace’ sites identified by Graham in southern Scotland, although at that time the study of these sites was still in its infancy. It is probable that Graham confused cultivation terraces with house platforms on the Hurl Burn hillside, according to John Terry (not the footballer) in his Lintshie Gutter excavation report. Regardless of how we characterise such humps and bumps in the moorland landscape, such features are nowadays recognised as indicative of later prehistoric settlement and farming activity. The serendipitous excavations at Lintshie Gutter, provoked by the motorway upgrade, revealed an amazing level of detail about this small settlement in a busy, yet remote location. Excavations focused on eight possible hut platforms. These are essentially flat terraces set into the hillside, upon which a timber round house would have sat; these buildings therefore were situated on slopes rather than the flat valley bottom, an early example of landscape manipulation. Excavations identified a number of timber round house remains, with structures ranging in diameter from 8m to 13m across. These building would have had turf or thatch conical roofs, and walls of wattle and daub panels. Most buildings had an internal hearth, some had an oven inside, and quernstone fragments discovered during the excavation suggested cereal processing had gone on as one would expect while coarse domestic pottery was also being made and used. Not all buildings were houses, and at least one stock enclosure was identified. Lintshie Gutter offers a remarkable insight into a way of life we have little conception of today. At least 30 timber buildings straddled the hillside here, probably not all contemporary with one another, but all built and in use in the first half of the second millennium BC (earlier than depicted in the service station mural). Such settlements were fairly typical in the Bronze Age in southern Scotland and northern England, and are usually situated in places that would now be difficult even to farm, never mind live, a result of the slightly more favourable climate enjoyed in Scotland for much of the 2nd millennium BC. A few days ago I visited the service station at M74 junction 13, although even before my visit I knew from previous visits that the mural, Lintshie Gutter painting and all, is no longer visible, a victim of the revamping of the facility which happened at some point over the past few years. Fisher himself lamented the fate of many of his murals which have now disappeared, some painted over, others destroyed by renovations. He said in an interview a few years ago, “it saddens me more to learn about the murals which have gone forever than ones which have been covered up; there is always the chance they will be rediscovered.” I asked a few members of staff when the mural had been painted over – someone who had worked there for two years told me there had been no mural in her time, offering a terminus ante quem for the paint job. Another member of staff vaguely remembered the paintings, dating to a time when the café had been a ‘Red Hen’. 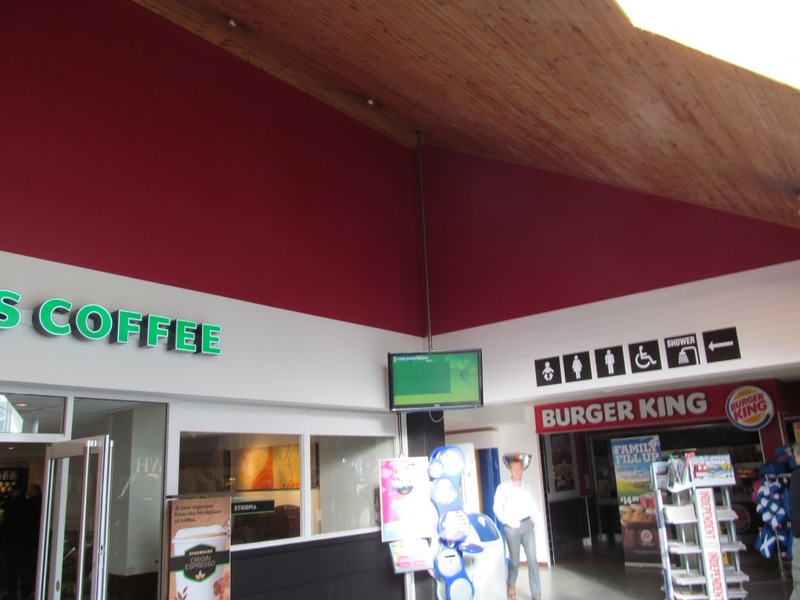 A third told me the service station was always being changed and redecorated, fitting for a place populated by people who are always on the move. The obligatory landscaping boulders in the service station car park, complete with rising / setting sun…. All that remains now in the foyer of the service station, where the mural used to be, is a harsh red painted wall, framing a Starbucks. The multiple layers of paint overlying the mural could be viewed as akin to the layers that archaeologists at Lintshie Gutter stripped in order to rediscover a long-lost Bronze Age settlement. Sadly, David Fisher died earlier this year, but some of his murals do still live on, such as at Gretna and Sedgemoor. 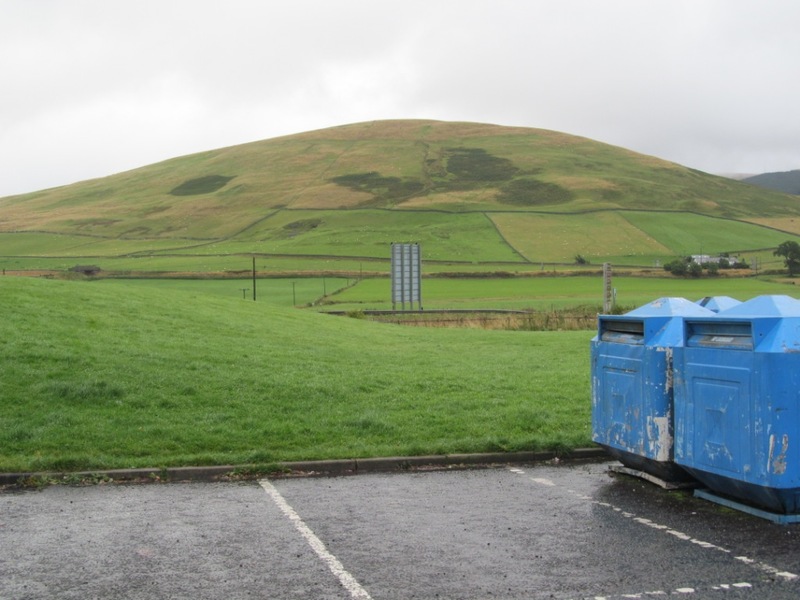 And perhaps one day, someone will apply some paint stripper and reveal once again his vision of the historic – and prehistoric – South Lanarkshire uplands. Sources: The Lintshie Gutter excavation was published in volume 125 (1995) of the Proceedings of the Society of Antiquaries of Scotland and was written by John Terry (not the footballer). This report is freely available online via the Society’s website. 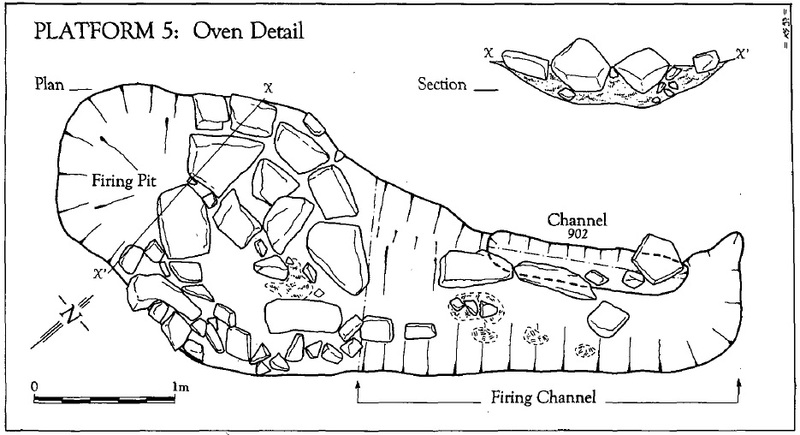 The oven illustration was derived from this report. The image of the mural itself was sourced from David Fisher’s website, which is a wealth of information on his service station murals but also his other projects. 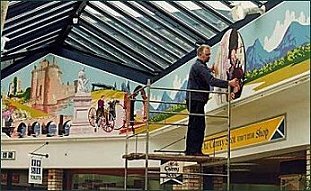 The quotations about the service station murals came from an interview he did with The Mendip Times, reproduced on Fisher’s website. The Lintshie Gutter photograph was sources from SCRAN, while further info about the road upgrade, and archaeology (and the road building image) can be found on the Biggar Museum Trust webpage. For a little more on the history of the M74, see the online UK Motorway Archive. Last week, I attended the European Association of Archaeologists (EAA) conference in Plzen, Czech Republic. During the conference, I gave a paper on the subject of urban prehistory, the academic debut of my peculiar version of archaeology. My intention was to explore the potential benefits of urban prehistory, within the context of a session that explored how archaeologists can help shape the future rather than just dwell on the past. The paper will be published in the not too distant future, hopefully in a freely accessible publication, and I will let you know when this happens. As it happens, the symbol of the 2013 EAA conference was the Jikalka shield, an amazing and ornate Bronze Age disc that was discovered in 1896 during house construction. It probably dates to the centuries after 1300BC. I know little more about the circumstances of discovery, but once again it indicates that wonderful things can be found even in the most unpromising of circumstances, and the location where the shield was found is now near a bus station. 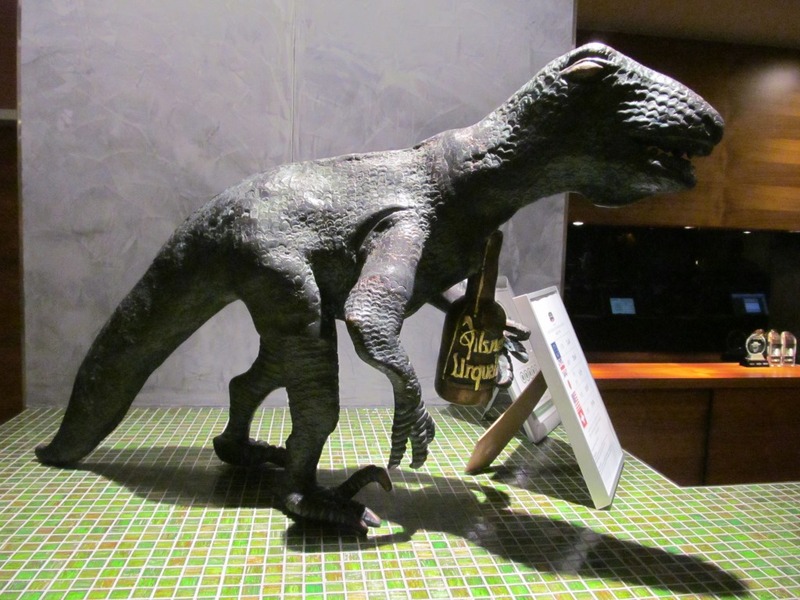 For the remainder of this post, I have reproduced an extended version of the introductory section of the paper I gave, as well as some urban prehistoric images from the picturesque city of Plzen. 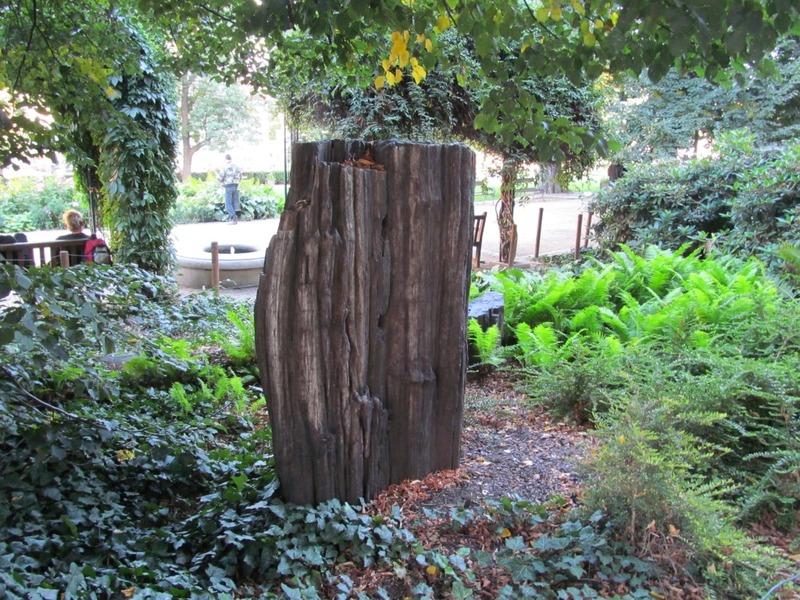 Fossilized Araukarity tree on the Plzen park ring, or a sculpture representing one? Whichever, it looks a lot like a standing stone! It is often said that the past is all around us, beneath our feet. But when we think about monuments like megaliths, we usually visualize them removed from us, in the countryside, rural, organic, green on brown, brown on green. This is the right place for standing stones to be found, the appropriate place for monuments of death and burial. Pretty settings. Places of remembrance. Quiet fields. Because what is the alternative? 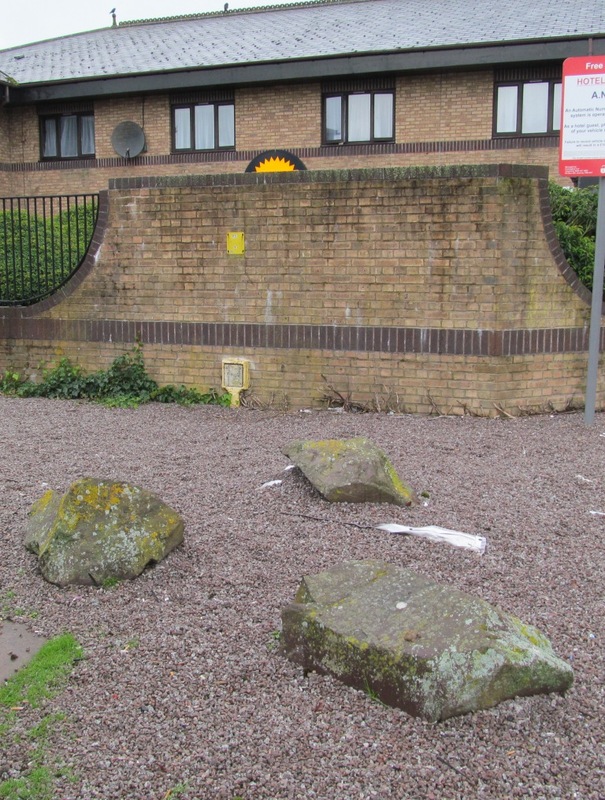 Standing stones in the city? Cairns amidst conurbations? Henges and high rises? Chris Tilley once suggested that megaliths in an urban environment don’t work, his example being dolmen within a Volvo dealership in Sweden. Graham Ritchie called a stone circle in a housing estate in Fife ‘a quaint garden feature’. John Bintliff has suggested that the ‘remote English countryside’ has a fascination for middle class archaeologists interested in ‘recapturing the experience of being a Neolithic or Bronze Age person’. There is a sense of loss when archaeologists write or talk about prehistoric sites within an urban landscape, a sense that something is missing, that the pastness has been knocked out of the site, that it ceases to be prehistoric in any meaningful sense of the word, that it has become urban furniture. And the process of urbanisation is ‘bad’: it has swept away most prehistoric traces of the past, leaving big empty spaces on our distribution maps. Because of this, archaeologists spend a lot of time trying to look beyond or through the present, back to the past, almost as if the present doesn’t matter and can be wished away. Standing stones by the roadside. We walk on past, or drive on past. There is nothing to see here. The present hardly matters. The location where a cremation deposit was found during a housing development, a cluster of Neolithic pits revealed when a road intersection was upgraded, cists in quarries, random ditches, rubbish standing stones, flattened mounds. Found by chance, investigated by archaeologists, and removed as quickly as possible. In most cases, forgotten, unmarked, hidden underfoot. What is urban prehistory and what are its benefits? For the past 10 months, I have been writing a blog called the urban prehistorian. This is my first attempt to articulate a vision for urban prehistory, which I see, in the spirit of this session, as a creative means to help improve urban spaces, empower local communities and inform landscape and townscape change. The blog contains stories about urban megaliths, and accounts of my own fieldwork, highlighting the potential of the past beneath our feet. Like communities, prehistoric places appear to be incredibly resilient and I want to document this. How do I define urban prehistory? At its most fundamental level, it is taking an interest in the traces, tangible and intangible, visible and invisible, of prehistoric monuments and activities within urban contexts, or places that have been developed. It is having an awareness of the various echoes of ancient activities that continue to manifest themselves in various ways within urban communities. In this paper, I want to focus on the aspirational qualities of urban prehistory. There is no sense of loss in urban prehistory, just one of opportunity, although at times loss has to be acknowledged. This is because I believe urban prehistory can act as an important reminder to archaeologists that in order to come to the best possible interpretation of what happened in prehistory, we need to understand the conditions within which we find the traces of prehistoric activities. The circumstances in which we engage with the archaeological record should be of interest to us. Urban prehistory should empower archaeologists to acknowledge the reality that engagements with the archaeological record occur in the present, mediated to us via the modern landscape and context, and this can neither be forgotten nor ignored. 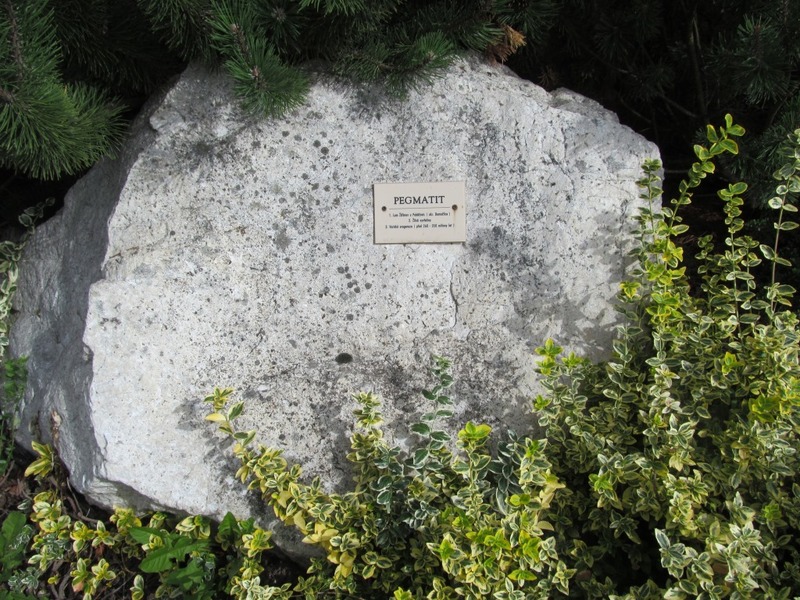 One of a series of boulders representing geological specimens from the region, in the grounds of the University of West Bohemia. This one is ‘Pegmatit’. But here I want to focus on the wider potential of urban prehistory beyond the narrower concerns of archaeological practice. Because urban prehistory is not about generating archaeological data. Most prehistoric sites in urban locations have either been fully excavated already, or have been removed or destroyed, or fundamentally altered. Rather, it is about other types of outcomes. Urban prehistory should be about raising awareness, encouraging creativity, and engaging people with the places they live. Because the existence of traces of prehistory in urban places affords a wonderful opportunity for us to engage with lots of people, and in particular lots of people who may not be able, or have the desire, to travel out into the country to visit a stone circle. Urban prehistory can be a tool to help inform people about their own street, village, town, suburb or city. It can give a sense of time-depth to a place that can amaze, and inspire creativity. It can allow connections to be made with people who lived and did stuff in the same place thousands of years ago, despite relentless change. This kind of information, all too often difficult to make sense of or just inaccessible to most people, can encourage communities to feel that where they live is special, and has been for millennia, often in places which are judged by wider society to not be special, to be mundane or worse. In other words, prehistoric archaeology in urban contexts and developed places offers a means to engage with the public in places which are often perceived as having no heritage or value by prehistoric archaeologists and wider society – housing estates, intersections, industrial spaces, peri-urban edgelands, leisure amenities. And this can, I hope, help to shape visions about the future of urban landscapes. 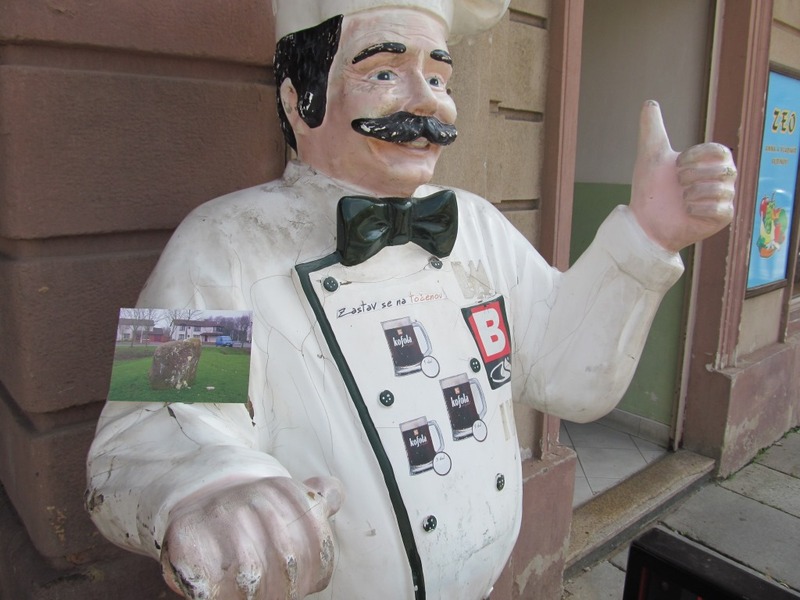 Chef showing his support for this highly fashionable Urban Prehistory postcard. Sources and acknowledgements: This paper was part of a session organised by a series of colleagues from the UK, Sweden, Greece and Austria entitled Creating Landscape Visions: managing the past while imaging the future. I would like to thank in particular Chris, Alan, Aphrodite and Gavin for influencing the content and offering support. Special thanks to Helen Green for reading an earlier version of the paper and giving me insightful and supportive feedback which helped improve the final version. The EAA logo was sourced from the EAA conference website, while the information on the Jikalka shield came from the conference programme. Finally, thanks to all those who attended the session and were nice to me after I gave the paper!